As card making ideas go, this at first may seem like a narrow category, but as with all the others, please remember that I am only giving you some starter examples. 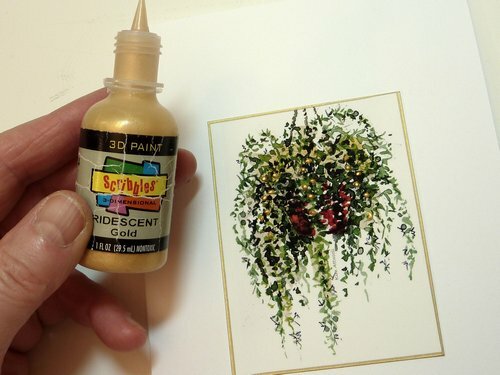 All of these embellishing techniques can be used for many different things. 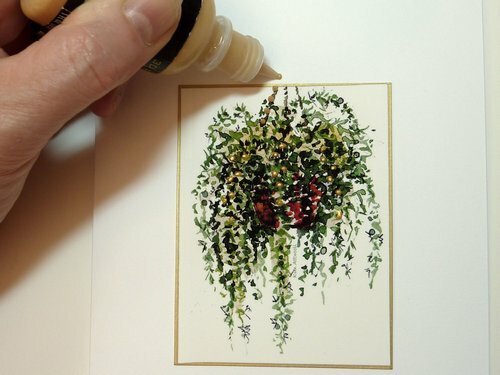 Every day I come up with new ideas and you will too, this is why making greeting cards is so exciting. 2. 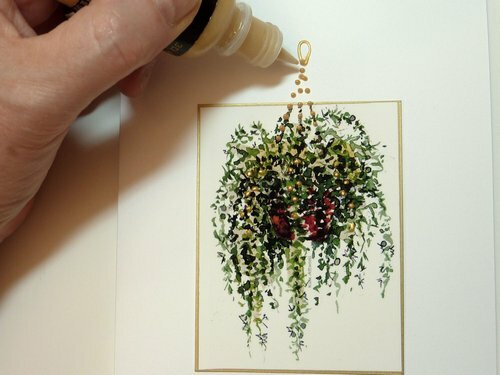 I follow the suggested lines of the hanging planter out of the picture and onto the card stock. Note that I'd previously popped some of the same gold into the fern. Look carefully and you can see that those spots are completely dry and shiny while the new ones I'm adding are still dull. 3. When the three paths of the planter's cords come together, I draw a hanging loop. See what a difference that makes! Look for other opportunities to use this embellishment. Maybe some will only need one or two strands but it still works.